The snowy white petals, red sepal and golden yellow centers of this hybrid are Mother Nature's way of expressing the subtle beauty that only she can provide. 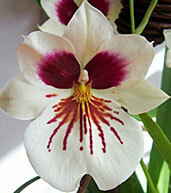 The round, flat blossoms of the Miltonia are at their most fragrant in the early morning and late afternoon. Like most pansy-orchids, this Miltonia requires little attention. 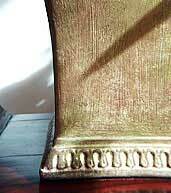 The plant is approximately 12 inches tall and shipped with 3-5 buds, which will bloom for up to 4-5 weeks. 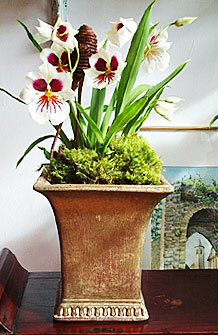 Accentuate the beauty of your potted white Miltonia in this hand painted French ceramic urn as shown in the picture. Own both of them now and enjoy! For other containers, view BASKET or choose below. Plants are shipped in bud approximately 1 week before blooming. The buds will open gradually, growing more spectacular by the day for up to 4-5 weeks. This way, you get to enjoy the full blooming stage of this magnificent plant. Each purchase includes care instructions and an exquisite gift card for your personal message--only from Beautiful Orchids.